As we discussed earlier, there are numerous advantages to designing and building a hobby CNC router. Designing and building any machine has the potential of being a good or bad experience. This is also the case wen designing and building a CNC router. The concepts of CNC routers are fairly straight forward, but you can quickly become overwhelmed in the process. Dont let this stand in the way. Thats why this guide is here; to keep you from making mistakes that might cost you time, money, and performance. Although this guide is primarily focusing on hobby CNC routers, the concepts may be applies to most any CNC linear motion system. For example, you could use these same concepts to build a CNC plasma cutter. If you are thinking of building your own machine, there is a good chance you already have a design in mind. This is to be expected. After all, its your machine. This guide does not aim to subtract from any of your ideas but rather supplement your project with valuable information. I wish that I had known a lot of this stuff before my first machine. It would have saved me many headaches and money. One last comment before we jump in head first. I am assuming you know some very CNC basics, such as what CNC means etc. If you do not, then you may wish to start at the CNC router Basics. 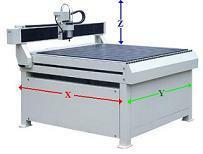 There are two primary styles of the hobby CNC router. This may seem contradictory as every design is unique. However, there are two overall designs types that you will encounter. Here you can see an example of each. Lets take a look at these two designs in detail. This type of design is less prominent in the hobby CNC router community than the mobile gantry design. However, there are reasons for choosing the mobile bed design type. 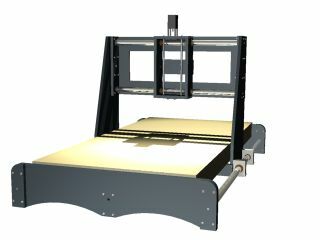 The mobile bed design is typically found on smaller CNC machines such as a PCB or engraving machines. For this size machine, the mobile bed design works well. Another advantage of this design is that creating a sturdy gantry that will not flex under load is much easier. This is because the gantry is stationary and does not have to be light or conform to a certain size to fit your linear bearings. With a mobile gantry, you must take into consideration the weight of the gantry itself and the size, in regards to the linear bearings on the x axis. With the mobile bed design, the gantry itself does not move, therefore you have more breathing room in regards to the weight, size, and structural design. There are disadvantages with this type of design as well. As the length of the x-axis increases the mobile bed design become less efficient. If you are unfamiliar with the x, y, and z, axis notation, take a look at the picture below labeling each. As we discuss the hobby CNC router, the x, y, and z axis will always be this configuration. With the mobile bed design, as you increase the x axis length your design become less efficient due to the size of the bed. When you see a mobile bed design employed on a hobby CNC router, the total x axis travel is usually between 12-36 inches. I have seen larger, however the design becomes increasingly complicated. If you made an extended x axis with a mobile bed, the actual size of the object you could cut would still be relatively small because the bed itself is still relatively small. 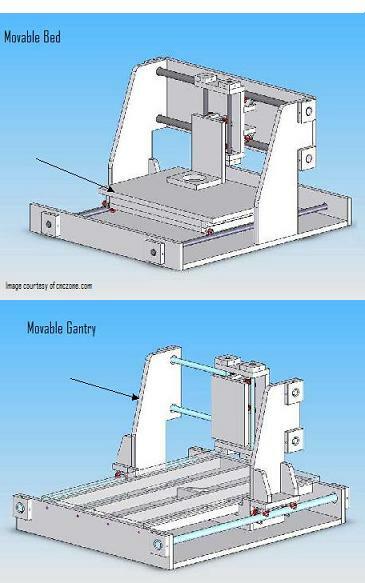 As a side note, the y and z axis usually changes very little between the mobile bed and mobile gantry designs. In conclusion, the mobile bed design is for you if you want a smaller machine that is compact and relatively easy to build, offering rigid a gantry but limiting on the overall size. Now lets look at the mobile gantry. The mobile gantry design accounts for probably 95% of the hobby CNC routers. This design type is similar to the mobile bed except the whole gantry moves along the x axis. This is advantageous because the overall size virtually limitless. It can be tricky to design a gantry that is light enough for your design and still offer little flex under load. Not to mention, you must design it to be mobile and fit some sort of linear bearing assembly. The mobile gantry design is very versatile. If you are building anything other than a small machine, I suggest this be your design choice. Of course, we will go into greater detail on both designs later. For now, you need to decide which design will fit your needs best. Now lets move on to some other considerations. The cutting area is the total distance the machine can cut along each axis. Keep in mind, this is one of those decisions that is likely to change as you search for parts. The linear bearings will probably be you primary restrictions. After all, most of us want as big of a machine as we can get away with. We will look at sizing in more depth later when we look at the structural considerations. Right now its a good idea to have an idea of the size of piece you want to be able to cut. Later you may find that you are limited to a certain size due to materials and parts. For example, some linear systems and materials may flex excessively over a certain span, which could also limit the cutting area. The cutting area is also called the machine travel for each axis. The travel is not the overall machine size, which brings us to our next consideration. Most of us want as big of a machine as we can get, however, you may be limited due to shop space or some other factor. So if you have a machine footprint limitation, keep this in mind as you design your machine. You do not want to have wasted space in your hobby CNC router design. For example, if your limitation is 36x24, then your ideal travel for that machine is 36x24. Although, it is unlikely you will achieve the maximum travel for your machine size, working towards getting as much travel as possible is worth the effort. One of the most important considerations when designing or building a hobby CNC router is the accuracy and precision of the machine. 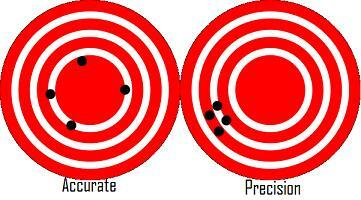 Dont get accuracy and precision confused. Take a look at the illustration below. You want to design and build your machine to hold a certain accuracy and precision. For example, you machine may be able to cut a piece that is within .0001 of an inch but the repeatability may be .1 inch. Many people design and build a hobby CNC router and live with the results, or keep adjusting to get the results they want. However, there are ways to design machine to hold a certain tolerance. For example, if you know you only need a tolerance of .01 inch and you know that all you will ever need, you can save a lot of money by designing for that requirement. On the other hand, if you want a machine to hold a tolerance of .0001 inch repeatable, then there are some design requirements that must be met to get the required performance. Typical hobby CNC routers hold a tolerance of .001 to .0001 inch. However, this is up to you. At this point all you need to do is have an idea as to what kind of tolerance you require. Keep in mind the larger the machine, the more costly it is to hold tight tolerances. The tools and materials can define your design almost as much as any other factor. Hobby CNC routers are constructed from all types of materials. I have seen machines made out of plastic, wood, MDF, aluminum, steel, and others. The material from which you construct your machine should be based on 3 criteria, budget, tools you have to work with, and materials available. It is hard to say which material is best as it varies with the design. I have seen machines made from MDF that hold better tolerances than those constructed of solid metal. That is why it is crucial to choose your materials ahead of time. Of course, your hobby CNC router will probably integrate many materials. However, you will have a certain material that will make up the bulk of your machine. The right design for a wood machine is not the right design for an aluminum or steel machine. The tools you have may also define the type of material you must use. If you do not have access to a milling machine or heavy metalworking equipment, then it may be hard to build your design correctly out of metal. This will eventually lead to a poor overall machine. On a piece of paper right down all the tools you have to work with, and then think of the material you can use. Keep in mind, I have seen machines built with as little as a drill motor and a hand saw. So there is no need to think that because you have limited tools you can not create a hobby CNC router. A popular method is to build a basic CNC router and then use that to build a nicer one. This method works well if you have limited tools. Do not take on a job that you do not have the tools for. We will look at properties of material later. There we will cover how to calculate deflection and other mathematical models with relative ease. This will help you design your machine to the load ratings you specify. Last but not least is the budget. For most of us, this is the one factor that will determine many of our decisions. After all, if we had the money, we would just buy one. Well maybe we would just buy really nice parts and bolt them together. I suggest you have an overall budget in mind and keep track of how much you spend. Below you will find an excel spreadsheet that you may download. 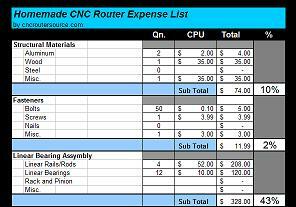 It breaks down all the components of a hobby CNC router and parts you will need. This will help you stay organized and see where you should spend the bulk of your money. I also included information on what you should expect to pay. As a warning, the bulk of your budget should go towards the linear motions system and the drive system. We will cover this in greater detail in later steps. So by now you should have the following decisions made or understand them at least.